ON a drive around Nassau County two and a half years ago, Paul and Jill Haining of Jackson Heights, Queens, fell in love with Sea Cliff, a quirky, gingerbread-laced village overlooking Hempstead Harbor on the North Shore. It is only a square mile in area, but they discovered that space had been put to excellent use. In addition to beaches, vistas and parks, they found Gothic and Victorian “painted ladies,” quaint Arts and Crafts cottages, and good schools. All of this banished their thoughts of upsizing to a three-bedroom apartment in Queens, sending them instead on a search of the narrow streets and steep hillsides in this outpost of about 5,000, for a house to call their own. “It was priced right and had multiple bids on it,” said Mr. Haining, 41, a vice president of Skanska U.S.A. Building, a civil engineering firm. He and his wife are expecting a baby; the setup seemed “ideal to start a family” — and also for the eventual purchase of a boat, which could be moored at the marina at Harry Tappen Beach, an Oyster Bay town facility. On a recent snowy night, for instance, 150 residents joined a pub crawl fund-raiser for the local beach association, paying $25 each to wander from restaurant to bar along Sea Cliff Avenue, the main shopping and dining street. Similarly, in June, 120 families will set out cast-off treasures in a community garage sale, their homes marked on a map drawn up by the civic association. Then, at a local park on the last day of school, the association hosts an ice cream social, scooping out 200 free sundaes. And come October, in a ritual that dates back 30 years, newcomers will be invited to a party at a resident’s home to be introduced to the mayor, the trustees and the librarians. Though increasingly upscale of late, Sea Cliff retains its aura as a bohemian outpost in the midst of cookie-cutter suburbia — an artists’ haven of sorts. 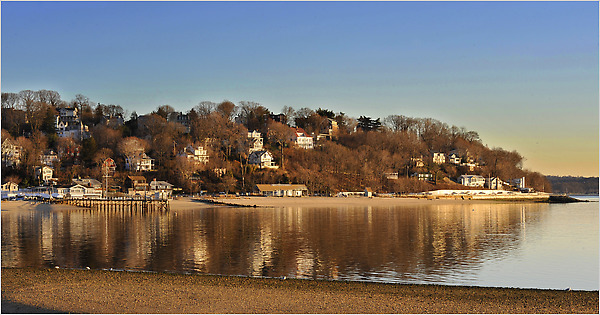 Sea Cliff, in the Town of Oyster Bay, hugs the shoreline south of Glen Cove and north of Glenwood Landing. It is bounded to the east by Glen Cove Avenue and the unincorporated areas of Glen Head. Among its roughly 2,000 residences, the village has cottages, bungalows and smaller Victorians with granny porches packed together along narrow streets at its heart, and larger Gothic and Victorian homes built into hillsides with commanding water views. Fifty-four buildings have local landmark status, and 29 of those are also on state and national registries, including Village Hall and the English Tudor-style fire department. Recent improvements include a new boardwalk connecting the business district and the waterfront — long overdue, in some residents’ view, as the last one was destroyed in the hurricane of 1938. Also, new streetlights and a village square clock have been added on Sea Cliff Avenue. And public and private foundation money was recently allocated for a $175,000 covered outdoor arts pavilion at the beach for live performances, Mr. Kennedy said. Prices have slipped, but “not as steeply as the rest of Long Island,” said Dan Maddock, the village administrator and assessor. “There has always been an irrational appeal for the village and the Victorian houses because of its quaintness,” he said. Patricia Desocio, an agent with Charles Rutenberg Realty, said Sea Cliff “seems to hold its value because it is very artsy,” but she also cited its wealth of homes with harbor views and their appeal to buyers from Manhattan. Mr. McCann enumerated a few other factors he viewed as assets: the one-hour commute to New York, a small-town atmosphere and walkability. The Multiple Listing Service of Long Island recorded 38 sales in 2008, for an average of $713,000. Last year there were 30 sales, and the average dropped by 14.9 percent, to $607,000. But the average length of time on the market held steady for each year, at 104 days. “Prices were lower because the lower end sold,” Ms. Sciubba said, citing first-time buyers wooed by the federal taxcredit. It was the million-dollar-plus market that stalled. Thirty-nine homes are now for sale: a four-room cottage on a 20-by-60-foot lot is listed at $319,000; a six-bedroom 1893 Victorian on a 99-by-172-foot lot is priced at $2.5 million. Two- to three-bedroom houses on tight lots can fetch as much as $550,000. Three- to four-bedroom Victorians, colonials and Capes on 60-by-90-foot lots range from $550,000 to $700,000. Eileen B. Heimer, a broker at Daniel Gale in Glen Head, said that of the five house rentals, the cheapest was a one-bedroom cottage, for $1,300, the priciest a two-bedroom colonial, for $2,300. Memorial Park, also known as Hippie Park, has an unobstructed view of Hempstead Harbor. On summer Thursday nights, its concerts (lemonade and cookies provided) draw a crowd. On Friday evenings the music revs up at Sea Cliff Beach. Harry Tappen Beach has a swimming pool, a playground, small boat launches and a 272-slip marina. The Sea Cliff Museum, in a former parsonage adjacent to Village Hall, is open on Sunday afternoons. The five-acre Clifton Park has ball fields. Central and Prospect Parks have playgrounds. Sea Cliff is part of the well-regarded North Shore School District, which has 2,876 students and also draws from neighboring Glen Head, Glenwood Landing and Old Brookville. There are three kindergarten-through-fifth-grade schools in total, but village children attend the Sea Cliff Elementary School, then North Shore Middle and High Schools, both in Glen Head. SAT averages in 2009 were 553 in reading, 587 in math and 550 in writing, versus 485, 502 and 478 statewide. All but one morning and one evening rush-hour Long Island Rail Road train between Sea Cliff and Pennsylvania Stations transfer at either Jamaica or Mineola. The transfer ride takes about an hour, the express ride a few minutes less. A monthly pass is $204, discounted 5 percent if bought online. Sea Cliff is 23 miles from Midtown Manhattan. The drive via the Long Island Expressway takes about 45 minutes, or an hour in heavy traffic. In the mid-1800s, Sea Cliff was a campground for Methodist revival meetings. Its close-set tent sites eventually became lots for small bungalows. By the end of that century the place was a resort. City visitors arrived by steamship and stayed at village hotels or boarding houses, some of which ended up converted for use as private homes. It was wealthy families from Brooklyn who built the large Victorians on the hillsides for their summertime use. The village was incorporated in 1883. A Methodist tabernacle built during Sea Cliff’s early campground years was used in the next century as a summer theater; actors like Yul Brynner, Shirley Booth and Basil Rathbone performed. The theater burned down in the mid-1950s. A version of this article appears in print on March 21, 2010, on Page RE7 of the New York edition with the headline: The Village of Artful Lodgings.